when the Play2 plugin is enabled, the HTML/JS code formatter doesn't work correctly when working on *.scala.html files (Play view template file extension). after reformatting. The indentation of the JS code is lost and the extra spaces in the html attribute make it invalid. When I disable the Play2 plugin or change the file extension to plain ".html", everything works as expected. Is this a known problem? Anything I can do about it other than disabling the plugin? 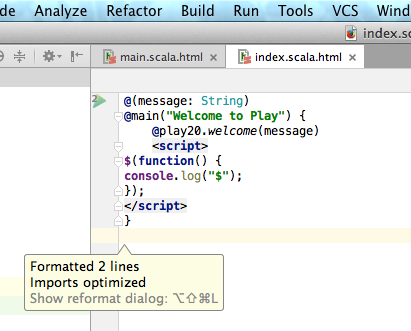 This is with IDEA 13.1.3 and the latest released Play2/Scala plugins. I also tried the nightly plugins, but that didn't help. Please note the introduced spaces (i.e. "5 px ;") in the style attribute which completely break the page layout.